New Shows added to Max and Ruby in the Nutcracker Suite Live! My kids absolutely love Max and Ruby. To me they remind me of the two characters. My daughter is one of those older sisters who tries to take care of her little brother and my son, well he's definitely like Max, always trying to get involved in whatever my daughter is doing either if it's with her friends or by herself. I was so excited to find out that the Max and Ruby in the Nutcracker Suite live show added more dates to their live show because one of the shows happens to be in my local town, so I'm super excited! 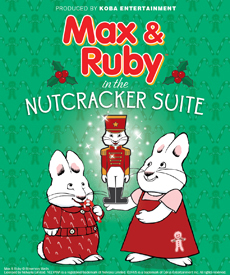 Max & Ruby in the Nutcracker Suite is the newest live show produced by Koba Entertainment. The company’s roster of celebrated theatrical productions also includes Toopy and Binoo and the Marshmallow Moon and The Backyardigans: Quest for the Extra Ordinary Aliens. Set to the timeless music of Tchaikovsky as well as delightful original songs, this 90-minute event boasts captivating original choreography by Patti Caplette – who has professionally danced in over 100 ballet performances of the Nutcracker with Canada’s leading dance companies: Les Grands Ballets Canadiens de Montréal and Canada’s Royal Winnipeg Ballet – beautiful costumes by designer, Anne Armit, and breathtaking sets by Gemini Award-winner, Brian Purchaluk. And just for you Just Us Girls readers for a limited time, you can use this pre-sale code so you can buy tickets before anyone else!